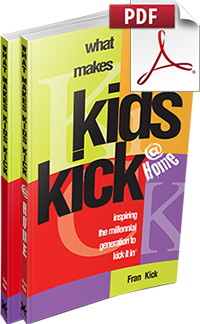 What Makes Kids Kick @ Home builds on the overall framework provided in the first book of this series by detailing what inspires kids specifically at home, while providing pragmatic steps that you can take to reach them, teach them and lead them. While every generation faces a changing world, the author takes into account the specific challenges this newest generation faces (born 1980–2000±) and the speed at which they face them. As these changes and challenges are vastly different from what previous generations experienced, Fran Kick asserts that current motivational strategies and tactics need to be vastly different as well. The goal is to help develop students to become self-motivated adults who have an internal, ever-present, self-inspiring motive to make things happen so they can become the next generation of leaders who KICK IT IN & TAKE THE LEAD! I constantly hear kids voice two complaints about the adults in their life – ‘they don’t listen’ and ‘they don’t understand.’ By helping us listen and understand, Fran Kick opens doors for positive communication with the kids we know, love, and long to lead into healthy adulthood. Fran Kick not only knows what makes kids kick, he understands what kids today need to be the kind of self-motivated, self-reliant everyday heroes the world will soon need them to be. Helping today’s generation of children to think for themselves demands a new adult-child level of communication that’s positive, unambiguous, and constructive. This book offers parents, teachers, and anyone else who works with today’s youth a clearer perspective of the strategies and skills most helpful in diminishing an over-dependence on the approval-driven choices of others. Guiding a more internally directed generation of kids who won’t fall victim to an externally manipulative world, What Makes Kids KICK can serve as your resource of resources. Fran Kick’s series of books on What Makes Kids Kick are a breath of fresh air and should be required reading to those of us who are parents or teachers. You will find them a wonderful tool for understanding what motivates drives, distracts, and frustrates our Millennial young people. Fran’s conclusions are laser guided and definitely on the mark. With 37 years as a high school teacher and having 6 children and 13 grandchildren I was thrilled to read Fran’s insights and amazingly thorough research concerning today’s youth. Being of the Boomer generation and having taught through three generations of students I was delighted by the way Fran dissipated the clouds of confusion about what makes our current young people tick.